Above is one of the famous of the Dogs Playing Poker painting. People make fun of these paintings, but they were created over 100 years ago and are still in people’s minds. I’m not certain that any blog post I write will still be around in 100 years. Most of us won’t create anything that will still be around in 100 years. 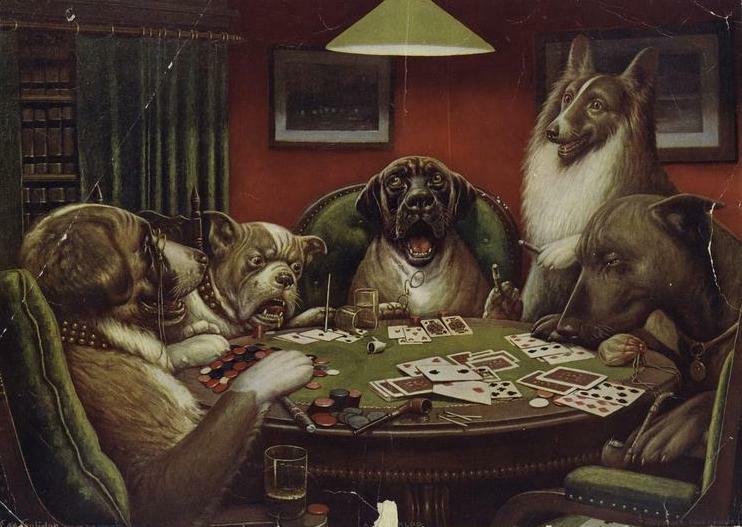 The Dogs Playing Poker series has 16 paintings in total. They were painted by Cassius Marcellus Coolidge in the early 1900’s. They purpose of the series was to sell cigars. Cassius Marcellus Coolidge lived 1844-1934. Here is information about his life. 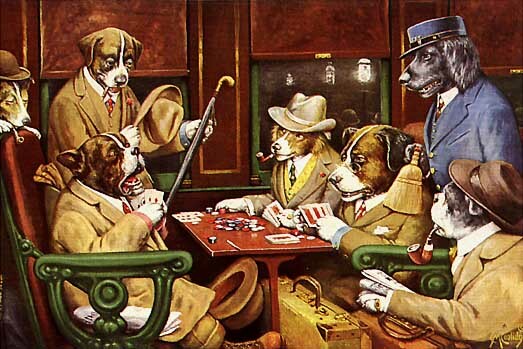 I don’t know if Dogs Playing Poker is great art, but it has passed the test of time. The pictures make people happy and don’t hurt anybody. Anybody who can create something that lasts and that makes people laugh has done something right. In 2005, two of the original paintings sold for $590,000. Here is a gallery of paintings by Mr. Coolidge. Below—His Station And Four Aces. do you think they had the same deck of cards that stix brought once? He said on Facebook that he has the painting at the top of this post in his home. stix in on facebook? is that legal? Amazing picture, I love it! It seems earlier versions on this subject hung in the LA County Courthouse cafeteria through the 1959’s and 60’s. As I recall there was a pair of paintings in oak frames painted by a saloon caretaker named Old Smith. One of the pictures had bullet holes in it. I have like eight of these pictures all different that my grandpaw bought for his dad from the man painting them off the street, I don’t know how much they are worth but I keep them in my gameroom on the wall. How can I tell if they were some of the originals. They are in old frames but are in good shape. Sheryl–I don’t know how you can tell. But I hope they are and you can sell them for a lot of money. Good luck. I have about 9-11 of these paintings (not the originals) My grandfather had them in the early 50’s. I have been wondering if they were worth anything? They are all different sizes and they all are behind glass. I have had them since the 50’s. They are really fun to look at. Hi, I have some one of a kind picture like demision framed coolidge artwork found with some twain books. I would like to kno if there worth anything? There very old looking but in marvelous shape. Can send pics. Not sure. Maybe a visitor to this post will know. I just love them! I`m a dog lover and I also paint. I`m probably the only one who sees some connection between this and Cezanne`s “The Card Players”. I have 5 of the paintings, I would like to know if they are worth anything. Or should I just sell them in my moving sale? I’m afraid that I am unable to offer you any helpful advice in this regard.